MOSCOW, Russia -- The Russian and Ukrainian governments have approved new agreements for Russian gas supply to and gas transit across Ukraine. Russian state news agency RIA Novosti quoting a government press release said "The price agreements are to be formalized through a special government resolution." It said the agreements are based on Ukrainian President Viktor Yanukovych's proposals and establish a new pricing structure. Prime Minister Vladimir Putin has instructed officials to prepare a draft resolution shortly, his spokesperson said. 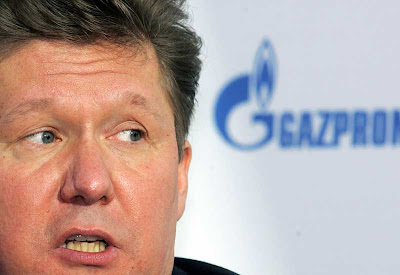 Alexey Miller, Chairman of Russian gas monopoly Gazprom, and Yury Boiko, Ukrainian Fuel and Energy Minister, had discussions in this regard at Gazprom headquarters on Friday, the company said in an online statement. It did not disclose details of the agreements. The news comes hours after Russian President Dmitry Medvedev said his government was ready to discuss cutting the price of Russian natural gas deliveries to Ukraine during his visit to that country next week. The Russian leader was speaking to media on the sidelines of a summit of BRIC nations - Brazil, Russia, India and China. "Our Ukrainian partners think that, for a number of reasons, our current gas prices are rather heavy to bear, considering the economic situation in Ukraine. This is an issue that is being discussed and I said from the very beginning to the new Ukrainian President that we are ready to [discuss it]," he told reporters. Medvedev said he was planning to hold an unscheduled meeting next week with his Ukrainian counterpart Viktor Yanukovich. An official visit of the Russian President to Ukraine will follow in May. An Ukrainian delegation led by Prime Minister Mykola Azarov had visited Moscow last month seeking a revision of contracts on imports and transit of natural gas from Russia. Azarov requested Putin to re-fix the contracts on lower prices, as the existing contract is "unprofitable for Ukraine." Relations between the two countries improved after Victor Yanukovych was elected Ukraine's President in February. Relations between Moscow and Kiev over gas supply are followed closely by Europe because Ukraine is a key transit point for Russian oil and gas supplies to many European countries. In January last year, Russia halted all gas shipments to Europe via Ukraine for two weeks amid a dispute over unpaid bills and new prices, resulting in a fuel crisis in European countries in the height of winter. Russia doubled the gas price it charges Ukraine after the dispute was solved. Ukraine currently pays about $305 per 1,000 cubic meters of Russian gas. In December, Moscow agreed to a 30% increase in the transit tariff for oil piped to Europe through Ukraine, avoiding interruption in supplies. Ukraine has been paying for Russian gas without dues for the past few months. Moscow has signaled Kiev should share ownership of transit gas pipelines and return property taken from Russian firms and tycoons by Ukraine's former leaders if it wants to see a cut in its Russian gas bill. A lower price for Russian gas imports is expected to ease Ukraine's economy which was hit hard by the global downturn.